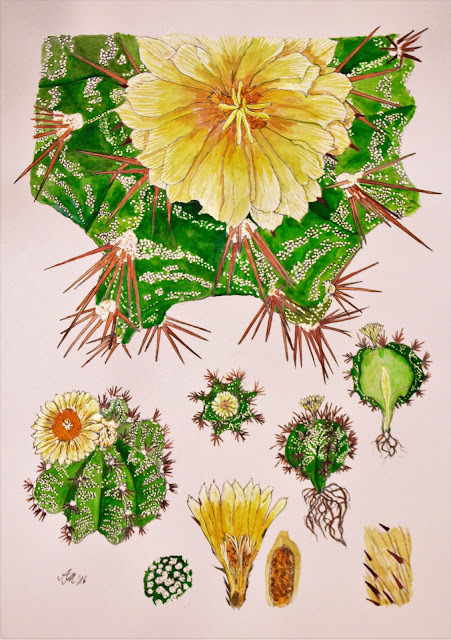 A synomym is: Echinocactus ornatus.The origin and the habitats are found at San Luis Potosi, Hidalgo, Queretaro and Guanajuato in Mexico. It grows in wild canyons and limestone cliffs sometime on near vertical rockfaces. The scientific name Astrophytum means „starplant“. The Star cactus is also known as “Monk's Hood”. It was first collected in 1877 from Thomas Coulter. The irisch physician and botanist sent the plant to the Botanical Garden in Geneve to Professor de Candolle. When Candolle took out the plant he suspected a fungus at first glance. But then he noticed that the white spots were small, woolly hairtufts. They might reduce the evaporation, protect from excessive sunlight and are a camouflage. - The plant blooms in summer. The flowers (6-8 cm wide) are pale yellow with bright silken sheen and scented. This type is a shortly columnar cactus appearing star-shaped from above, with 8 ribs and with white cross bands of wooly scales. It appears to be a very variable species especially for the density and distribution of white scales. It is the largest and easiest to grow and also the fastest of the Astrophytums. It is also generally more heavily spined than other Astrophytums. It needs to be at least 15 cm tall to bloom. This might take no less than seven years or more depending on the length of the growing period in the local climatic conditions. In nature it is rare today.